In the 1960s Josée Covington wanted to start a travel agency. There was only one problem — she didn’t have any money. To address this problem, she sent a telegram to her family in Luxembourg, saying, “Starting my own business. Need money. Send me lots.” They did. She used the money to launch Covington Travel in 1967 in a 500-square-foot office in downtown Richmond. Fifty years later, the Glen Allen-based company has grown to 84 full-time employees serving more than 300 corporate clients. Profitable since its third year in business, the company is on track to reach $95 million in sales this year. The challenges of starting a business in the 1960s were different than the hurdles new companies face today. Back then, banks typically required a woman to have her husband cosign a loan. Covington, however, was able to secure a loan on her own. “They knew what kind of income was already coming in, so they didn’t hesitate to give me the rest of the capital,” she says. The firm began by planning travel for leisure customers, but today, the lion’s share of its business comes from corporations. For example, the company plans group travel for nonprofits or business trips for executives. The rest of the business involves organizing vacations and meetings. The emergence of travel sites on the internet hasn’t been an issue for the company. “It’s done wonders for us, because people who need complicated travel arrangements are not going to find it on the internet,” says Covington. Her son, Paul, the company’s chief financial and information officer, adds that the firm also has the technology necessary to serve do-it-yourself customers who, for example, prefer to book trips using the company’s online booking system. 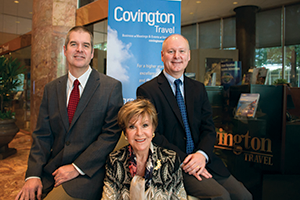 The biggest challenges currently facing Covington Travel are geopolitical issues impacting how or where people travel. The Zika virus, for example, caused people to avoid trips to impacted countries. However, the company says it was able to find other suitable destinations.